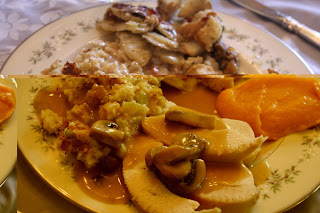 The Food Gospel According to Ruth: The Turkey Options! There are really a million ways to cook the perfect turkey....there are also a million and one ways to ruin a perfectly good bird! When it comes to the Thanksgiving turkey here are my favorite option....plus my favorite gravy recipe! I must give fair warning and plead with you that frying a turkey is a delicious way to cook the bird but you MUST know what you are doing, you have to be paying attention (and by that I mean sober) and please, for the love of all that is good on this earth, please keep children away from the hot grease! My dear friend, Reed, has fried several turkeys for us over the years and every time he does it I am convinced there is no better way to cook the bird but there is one enormous piece missing from this puzzle...the drippings for the gravy. As this is a must in our family we usually roast the turkey in the oven but if your family is freakishly obsessed with gravy like mine I highly suggest this option....or you can do what I am going to do this year and that is HAVE BOTH! !